Ada Diamonds adheres to the internationally accepted criteria to grade the quality of a diamond: the 4Cs of Cut, Color, Clarity, and Carat Weight. The better the cut, color, and clarity, the better the sparkle. The greater the carat weight, the bigger the sparkle. Click on the topics below to learn more. No two diamonds are exactly the same, which is what makes the process of finding the best diamond both an art and a science. Each stone, mined or lab grown, has unique properties that determine the quality of its sparkle, fire, and life. 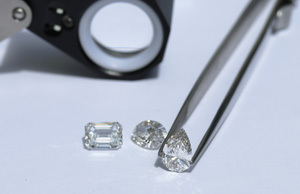 Ada Diamonds prides itself on sourcing the highest quality lab diamonds in the world and we avoid the mediocre diamonds that are sadly sold to many consumers. We don’t expect you to be a diamond expert, and we take seriously the responsibility of providing you with the best option possible. We refuse to sell unexceptional man made diamonds. The majority of diamonds sold by Ada Diamonds are graded by IGI in Manhattan. The IGI Diamond Report is a statement attesting to the authenticity of a diamond and provides a reliable and accurate report of its identity and grade based on an internationally recognized system. Each diamond is scientifically analyzed by several gemologists who use their experience in combination with state-of-the-art equipment to produce an accurate description of the characteristics of the diamond and the quality of its cut. GCALis a diamond research and identification laboratory specializing in guaranteed diamond grading. GCAL is the diamond geek's preferred grading lab, as every diamond GCAL grades is evaluated by their proprietary Direct Assessment Light Performance analysis. This method analyzes the actual diamond and not a theoretical model, which means every nuance, such as inclusions and transparency, are considered in the grading. GCAL proudly offers a Consumer Grading Guarantee that provides cash-back for any error in grading or identification of a certified diamond. Many of Ada's fancy colored lab diamonds (blues, pinks, yellows) are graded by GIA; however, Ada's colorless lab diamonds are most commonly graded by IGI. The reason that we do not regularly use GIA for our colorless lab diamonds is that GIA made a business decision 2006 to not grade lab diamonds as specific as a grading by IGI or GCAL. GIA will only say that a lab diamond is colorless, not D, E, or F color. GIA will say a diamond is Very, Very Slightly Included, but not VVS1 or VVS2. In the past, GIA has produced full specificity grading reports for some of the largest lab grown diamonds ever produced. However, for stones below 5ct, GIA has refused to offer full fidelity grading, despite heavy interest from sophisticated consumers. If a GIA grading is important to you, we are happy to send a diamond of your choice to GIA to have it graded a second time. It normally takes them a few weeks to return the diamond along with their grading report. Below is an example of a lab diamond that was first graded by IGI and then by GIA. Mining diamonds from the earth is energy intensive and ecologically invasive process. Some open-pit diamond mines are more than 3 miles wide. For the prototypical 1 carat diamond, over 5 tonnes of earth must be blasted and extracted by heavy diesel equipment. Every year, millions of tons of greenhouse gasses are emitted to mine diamonds in fragile ecosystems around the world including the Canadian and Siberian arctic tundra, the desert of Western Australia, and rivers of Africa. Ada's diamond growth processes are more energy efficient and sustainable. Many of our suppliers are already using renewable energy for their diamond production. Virtually no water is used to grow diamonds, and it only takes about a gram of raw carbon (graphite) to produce every carat of diamond that we sell. All by-products and chemicals used during the diamond growth and jewelry manufacturing processes are either recycled or properly disposed of via chemical processing companies. Mining, cutting, and polishing diamonds are extremely labor intensive and low margin operations that often take place in countries that have a high risk of exploitative labor practices according to the United Nations. Ada Diamonds requires all of our suppliers to certify that their labor forces are made up of adults of legal working age who work on their own free will. Ada Diamonds proudly works exclusively with lab grown diamonds, eliminating the possibility of mined diamonds of questionable origin entering our supply. Unlike mined diamonds, which are purchased in mixed parcels of unknown provenance, we purchase directly from modern companies staffed by scientists, physicists, and skilled technicians. All of Ada's larger stones are verified by gemological laboratories and laser etched with an identifier that forever marks the origin of the diamond. While we can turn graphite into diamond, we cannot turn lead into gold. We are working toward using 100% recycled materials in all of our jewelry, and guarantee that all of our earth-extracted gold and platinum has been mined sustainably and responsibly. We are proud signatories of No Dirty Gold's Golden Rules. There are over a billion carats of diamond gemstones in circulation today. The quality of those diamonds vary widely. Our jewelry designs are meant to showcase only the world's best diamonds — with superior brightness, color, flash, fire, and scintillation. Ada Diamonds buys gemstones directly from the manufacturers and closely checks every diamond before it is set in jewelry to ensure that it meets our exacting standards. We donate one percent of our profits to philanthropic causes through our Sixth Element Program. The nonprofits that we support provide health services, natural disaster response, and educational opportunities to people around the world. Put another way, your purchase from Ada Diamonds will brighten not just your world, but also the world of others around you. I acknowledge that I am purchasing laboratory-grown diamonds that are proudly createdby scientists above the Earth, not extracted or mined out of the Earth. Ada Diamonds only sells human-created diamonds that are grown in laboratories around the world. We publicly (and proudly) disclose that all of our gemstones are not of natural origin or extracted from the Earth, but are instead created and cultured by scientists in sophisticated laboratories. Every Ada Diamond larger than 1/2 carat is graded by an independent gemological laboratory that specializes in testing and grading diamonds, both mined and grown. These laboratories are located in Antwerp, Hong Kong, or the United States. Every larger diamond that Ada sells is permanently laser inscribed on the girdle with a unique identifier and the words 'lab created'. When your Ada Diamond(s) are delivered to you, you will also receive the grading certificate(s) of your diamond(s). These unique identifiers can be referenced on the independent laboratory's website at any time. The mined diamond industry is quite worried about undisclosed lab diamonds being mixed into parcels of mined diamonds by unethical actors. Ada Diamonds shares their concerns and publicly commits to support efforts to avoid mixing mined and made diamonds. Ada Diamonds has the opposite concern of the mining industry. While we are certain that our larger diamonds are of laboratory origin, we worry that smaller mined diamonds could end up in parcels of grown diamonds that we purchase from our suppliers, but we make every effort to ensure that even our smallest diamonds of 0.005 carats are lab-grown. Because a laboratory-grown diamond is structurally and chemically identical to a mined diamond (a crystal made up of carbon atoms in a cubic structure), a gemologist or jeweler cannot tell the difference between a diamond that is grown in a lab and a mined diamond with natural light, traditional tools, or magnification. The easiest way to identify a laboratory-grown diamond from a mined diamond is that it is too uniform and too pure to be of subterranean origin. There are scientific tools that can detect when a diamond was not created in the chaos below the Earth: high end laboratory microscopes with specialized ultraviolet light, polar filters, and trace element detectors. At Ada Diamonds, we use the exact same detection tools that the mined diamond industry is using to ensure that no unethical actors mix mined diamonds into any of our supply chains.